I was quite surprised when Singular International rider Mario Donatelli got in touch to tell me he had an entry for the epic event that is the 3 Peaks Cyclocross, billed as ‘The Hardest Cyclocross Race in the World’ ever. Not surprised because he’d got an entry, or that I thought he wasn’t up to it, but because I thought he would have learnt from my experience last year. 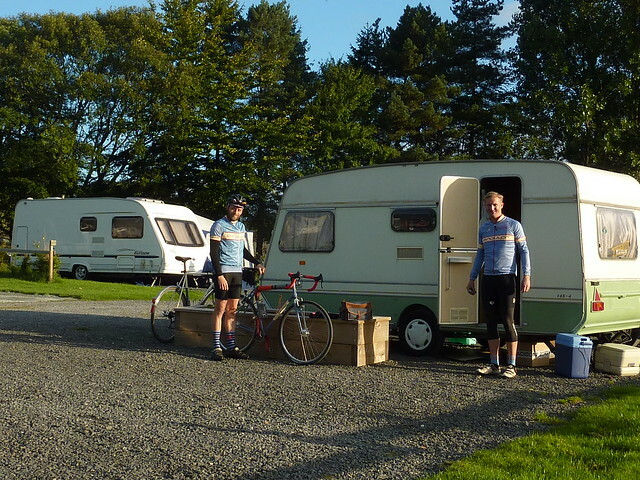 Anyhow, Mario arrived very late on Thursday night and we thought we’d get out for a bit of a local spin on Friday. The trails were in such perfect condition we just kept riding, taking in all the best bits of Ashridge. 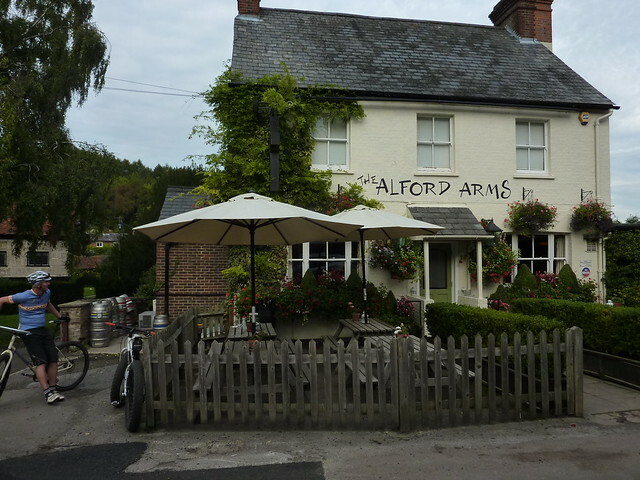 We stopped afterwards for a beer at one of my favourite local pubs. Mario was on the Puffin proto and loving it, and I had my first ride on the Gryphon with Jones H-Bars which I immediately fell in love with. A fairly slow old drive thanks to heavy traffic, it took us nearly 6 hours to get up to a lovely little campsite just outside Settle. 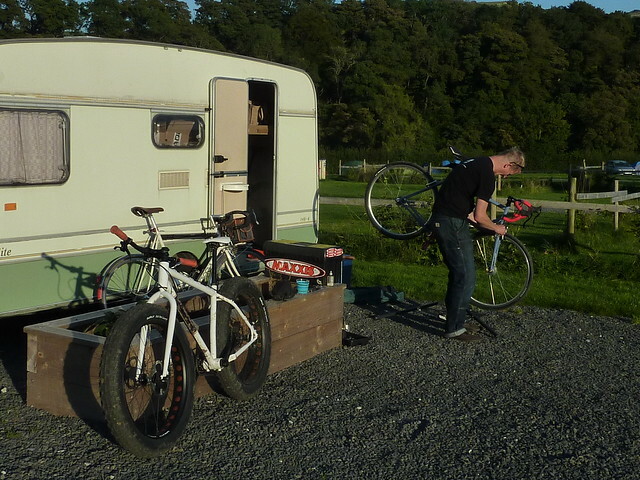 We got my new/old shonky caravan set up and did a little bike assembly and fettling in the sunshine. 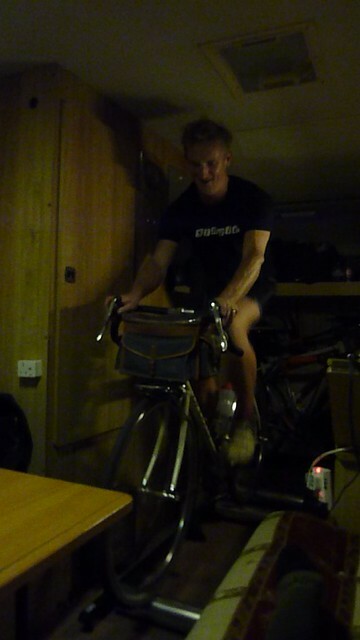 As I’ve got the Masters Track Worlds next week (gulp…) I took up the rollers for a bit of a spin to keep the legs limber after a long car trip. A good night’s sleep and the morning dawned bright and clear, we geared up and got ready to roll on out. 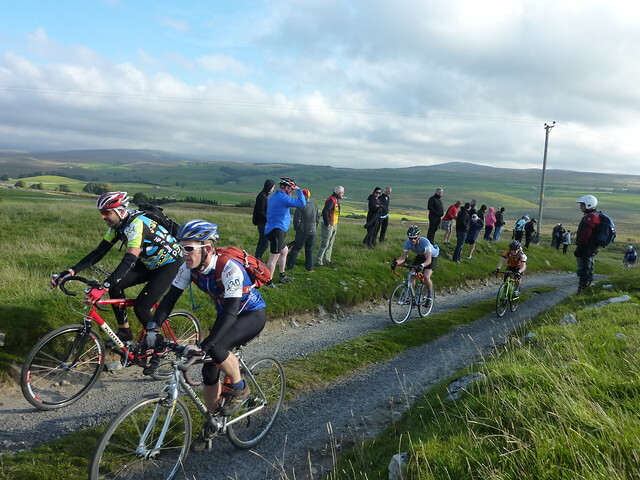 We had just a couple of miles to head up the road to Helwith Bridge for the race start. My plan was to help Mario out as much as possible, and get a bit of an easy spin in my legs. 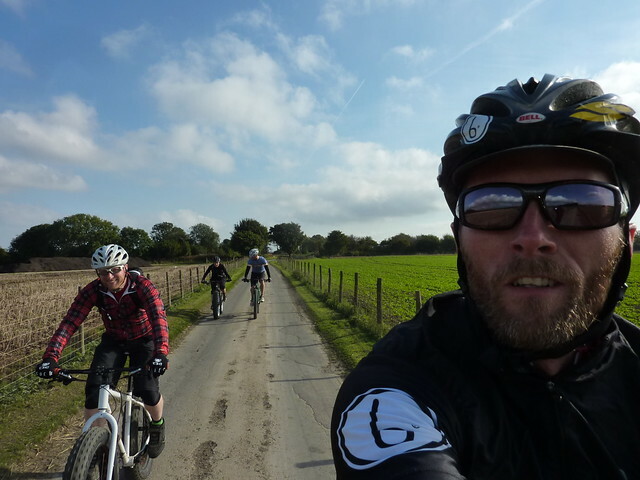 It was a perfect day for either a leisurely cruise on on the road, or an evil haul over the three highest peaks in Yorkshire with a cyclocross bike…. 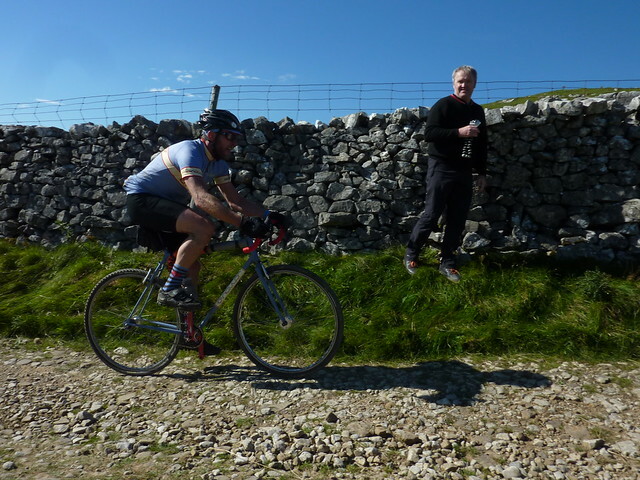 I headed out in advance of the race to the foot of the first climb up Ingleborough, headed a little way up the track and waited for Mario to come through. And waited. And waited. I knew he’d be spinning out badly on the fairly flat road sections, but I was starting to wonder if something had gone wrong as he hove into view smiling away. “What’s up?” I asked, thinking he’d perhaps punctured, “no problem” he replied – “it’s a long day”. Sensible approach. I headed a little further up the road thinking I’d catch him coming off the second peak Whernside, when I realised that if I did that I’d only see the fast guy come blazing by and miss most of the excitement on Pen Y Ghent. So I turned tail and headed back down to Horton and the base of the final beast. I made my way up the trail when I saw Geoff Waugh who captured this great image. While the other two peaks are an up one side and down the other affair, Pen Y Ghent is straight up, and straight back down. Geoff had picked a good spot in the middle of a fast section with a good view of riders both going up and coming back down. As I’d not seen him for a while, I stopped for a chat and ended up staying in this spot for the rest of the afternoon. With no central marking, nor obligation to keep to one side, people crawling up the hill and others flying down – people, kids and dogs thrown into the mix and it’s quite astonishing there aren’t more serious accidents. So it was pretty entertaining watching this spectacle unfold, heckling and cheering all and sundry. It took a while, ok, the best part of 2 hours, between seeing Rob Jebb scorch up hill on his way to an incredible 10th victory and seeing Mario grinding past. But grind he did and and it was immensely satisfying to see that he would make it. I waited a little while longer then headed back down the hill so I would catch him at the finish. I was quickly reminded why Landcruisers at 80psi are the typical choice for this race, my super supple Grand Bois 26s getting two flats in very quick succession…. Mario rolled in having been out a little over 5 hours, not that fast a finish, but a finish nonetheless and as far as we know the first completion by an Italian on a singlespeed. We rolled back down to the caravan, had a nice risotto, and Mario promptly passed out. Monday was significantly more gloomy, but we’d arranged what I thought would be a relatively nearby visit to Wayne at our new dealer EDS Bikes near Dalby Forest. 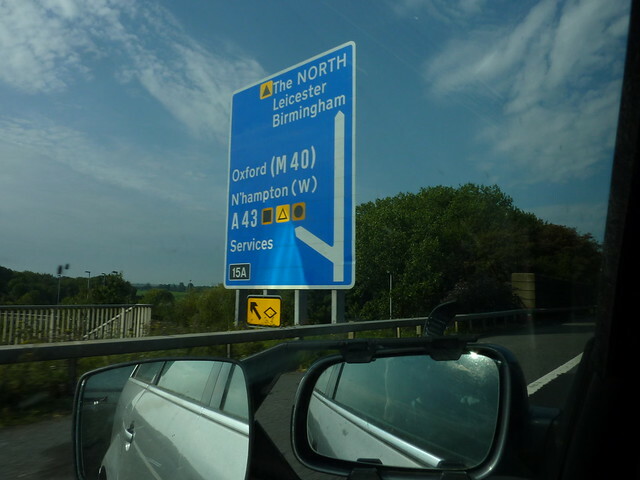 Thinking ‘it’s all Yorkshire’ does not mean it is very close – 2.5 hours later we got to Snainton. The beautifully paired Wayne and Jane run a great little shop stocking various non-mainstream brands and will soon fit Singular in to that mix. As they are officially closed on Monday, they kindly took us out for a quick blast around the forest. We left a couple of bikes with Wayne, and headed off back down the road. I asked Mario what he’d thought of the trip ‘I think I come back next year’ – that was all I needed to hear. This entry was posted on Friday, October 4th, 2013 at 10:31 am	and is filed under Uncategorized. You can follow any responses to this entry through the RSS 2.0 feed. Both comments and pings are currently closed.